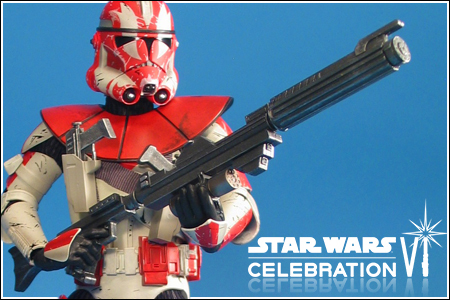 When revealed on May 8th, 2012, Sideshow Collectibles' 1/6 scale Militaries Of Star Wars Commander Ganch figure became the first Celebration VI exclusive announced. The figure was based on the Star Wars: The Clone Wars webcomic series, and comes equipped with both his Phase I and Phase II buckets. While it has been suggested that there were only 300 pieces made available at Celebration VI, no official production number has been publicized.